Itching to know why? Because I literally eat it every single morning without fail. It was recently brought to my attention that [most] girls say “literally” far too often. A wise man explained to me that 97.4% of the time girls say “literally,” the meaning of the sentence would not change one bit if “literally” were removed. The above sentence applies. The theory is literally so true. My apologizes for being president of the “literallyicanteven” club. I digress. For a while, I was having this exact smoothie in a more slurpable version (as in I drank it from a cup with a bit more almond milk rather than a bowl) but there’s just something about a super cold and creamy smoothie with crunchies on top that gets me every time. I didn’t used to be the kind of person that ate the same thing for breakfast every day. I’m sure you can tell from my “What I Ate Wednesday” posts that I like eating food with different flavors and textures at all times. But, BUT…now I wake up each and every morning craving the EXACT.SAME.THING. This beautiful bowl of glory that disguises every superfood known to man in its chocolatey greatness. It’s not one of those smoothies that you eat because you know it’s good for you. That’s just an added bonus. It’s a textural paradise for your face hole and it tastes like happiness. I start work at Alchemy at 6am three to five times a week. If I didn’t have this bad boy to look forward to at 7:30am, I don’t know if I’d survive. 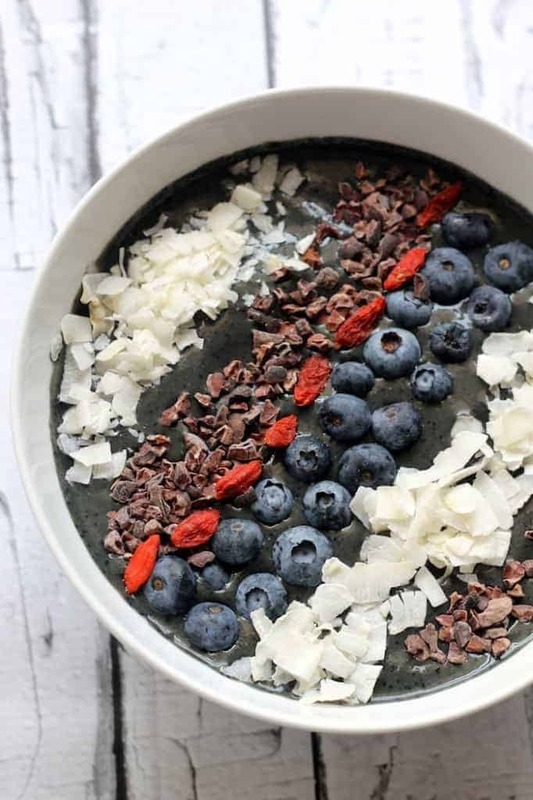 I mean, this smoothie bowl is the reason I get out of bed every morning. It’s my alarm clock. I highly recommend you pre-make a few smoothie baggies on Sunday night so breakfast is a breeze. Simply place all the ingredients except the optional date and almond milk in a small plastic baggie, repeat, and place the baggies in the freezer. Then in the morning, dump a baggie in the blender with the almond milk and date (or sweetener of choice) and let ‘er whirl! I usually make four bags at a time. Note that frozen spinach is key to the thick texture here. I get the loose flat leaf kind, not the solid block. If you don’t use frozen, you’ll want to use less almond milk. It should be thick but still pourable. As far as superfoods go, I pretty much buy everything in bulk from Amazon. When your breakfast every morning involves hemp seeds, raw cacao, and cacao nibs, it really pays to buy in bulk. For example, I get 2-16oz packages of this organic raw cacao on Amazon for $23.18 as opposed to paying $9.99 for an 8oz package in stores. That’s nearly double the price! As far as plant-based protein goes, my favorites are Vega Vanilla Protein + Greens and Skoop Vanilla. Adding plant-based protein powder really helps hold me over till my mid-morning snack attack. My topping of choice are always a tablespoon of cacao nibs and a handful of Love Grown Power O’s (which are made of beans). I die for the crunch. Check out last week’s What I Ate Wednesday post to see what my bowl looks like in real life when I’m not spending three hours perfectly aligning blueberries. For the purpose of pretty blog pictures, I added some goji berries, coconut, and fresh bloobs to this bowl. She looks like a big bowl of America! Cheers to the breakfast bowl that you’ll never ever EVER get sick of. Ever. 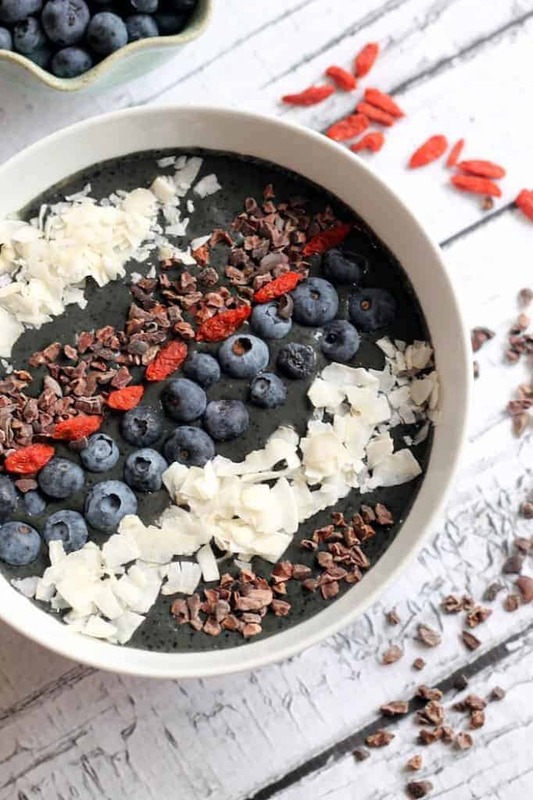 A thick, creamy and flavorful smoothie bowl packed with fruits, veggies ,antioxidants and plant-powered protein for a filling and delicious breakfast! Toppings of choice: cacao nibs, fresh fruit, granola, cereal, coconut, goji berries, etc. Place all ingredients in a high-speed blender (I used my Nutribullet) and blend until smooth and creamy. It will be thick. Pour into bowl and top with desired toppings. I bet there’s something better to look forward to over this. No, not me. The cupcakes made of tears and baking soda. The cupcakes were too salty. We’re eating this instead. Except sub splenda steak for cacao nibs. I have been loving smoothie bowls lately. It’s all about the added texture the toppings bring. I waited much too long to try smoothie bowls, that’s for sure. This one looks fabulous!! This is right up my alley! I love how versatile it is. Thx for sharing. Great pic too! this looks so refreshing and perfect for a hot and humid day! smoothie bowls are always my go-to lunch, they are so addicting! I love how blue this is! It’s so pretty :) I am excited to get smoothie back into my life post-Whole 30! I’m calling it…first breakfast of your post-whole30 life. YES. I don’t think I could ever crave a smoothie when I wake up! Haha! I need something carby/bready! Sometimes I have a rice cake or toast on the side :) I used to crave carbs but I seriously only crave smoothies these days! Toppings make smoothies 1000 times better. I need to try adding frozen spinach to my smoothies! Right?! Frozen spinach gives it the BEST texture. A must-try! Hahaha I love your reasoning there! Life is so much better when breakfast is already all thought out for you :) YES PLEASE. Bowl of America, get in my face! I have to admit, I’m pretty jelly of your daily breakfast…I mean all the nutrition, all the color…sheesh, girly, you really know how to start the day off on the right foot! I’m sure your brekkie’s are just as (if not more) beauteous than this bowl of glory!! I just can’t get on the cold breakfast train! I am on the repeat-breakfast train because breakfast routines are hard to break. I love that this smoothie contains cacao- all my favorite smoothies do! Can you taste the spirulina if you add it and what brand do you buy? This looks delicious! Alexis, any suggestions for someone who normally eats breakfast at work? Typically I make oatmeal at work and can’t figure out who to adapt this. Any thoughts would be appreciated! yesyesyesyesssss- need this in my life STAT. This looks so yummy and refreshing – especially considering how hot it’s been! Definitely will try! OMG, I literally want to smash my face into that beautiful bowl of bloobs! I love the idea to add cocoa nibs. Little bits of heaven with every spoonful! If anything could get me out of bed, it would be this! 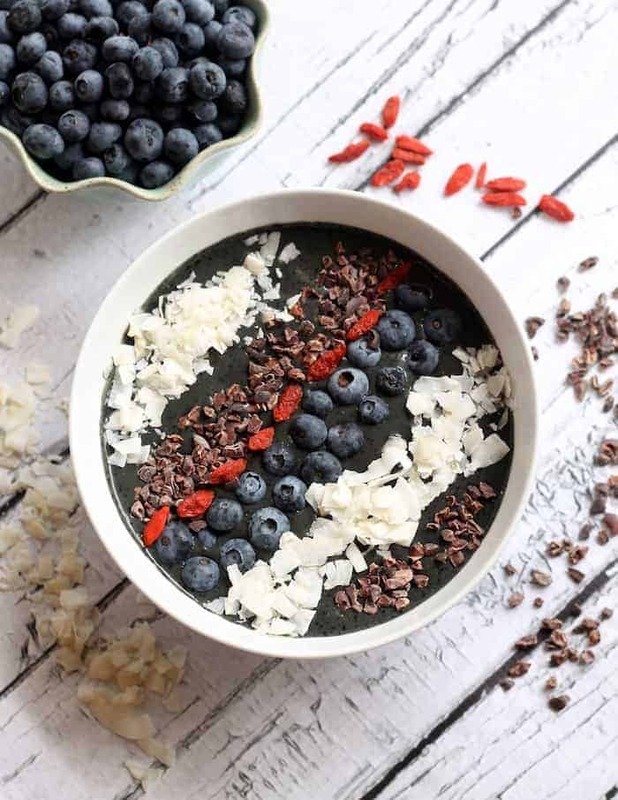 I am always so envious of your smoothie bowl creations! This looks delicious! 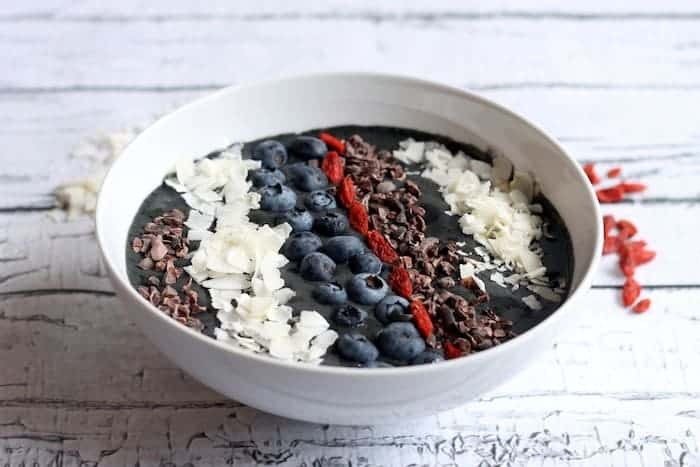 I travel a lot, and was wondering if I could blend this and a few of the other smoothie bowls, and leave them frozen for a week, then take out the night before and enjoy for breakfasts? We travel in an RV and only have electric 1x a week..Freezer space is limited..and am trying to make clean foods for about a week at a time. Thanks..